ALIEN: Covenant – The Crossing: Coda Blue | "DESTROY ALL FANBOYS!" Well, well, well. This is very interesting indeed. For one, it’s excellently shot and edited, albeit about a minute too short for my tastes. “Too short?” you’re thinking? “It’s supposed to be a SHORT!” you say. Well, okay, it goes like this: although it’s the perfect bridge between Prometheus and the upcoming ALIEN: Covenant, it feels as if it’s absolutely popping up on the AC Blu-Ray as a bonus. But curious me wants to know if MORE was shot because I have questions. What would be cool is if future disc, streamed and cable versions of Prometheus add this onto the ending as a post-credit sequence just to give that film a bit more oomph. It certainly needed a kicker that was better than the ending it got in the theatrical cut. That said, I wonder if this gets shown in the theater before the big-deal feature? That would work as well for those new viewers who haven’t seen the previous film and want a brief wrap-up appetizer befre the main course. So, I guess that’s going to end up on a disc as well (mark my words, I guess). Hmmm, okay… back to work. I’m a bit behind in stuff thanks to more stuff and wanted to watch the original ALIEN at some point today. 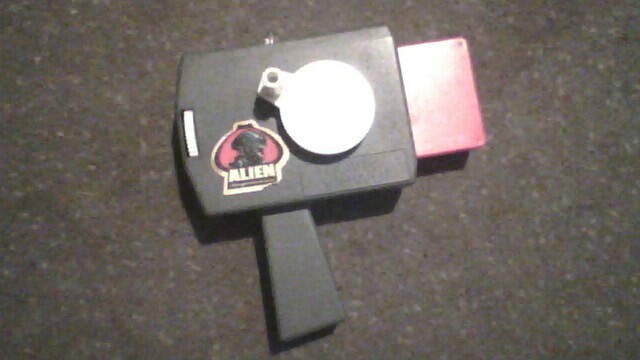 But that’s not going to happen, so I did the next best thing and dug out my ancient Kenner ALIEN Movie Viewer for a quick fix. Yep, it still works fine, noisy cranking reel action and all. The film strip in the cassette is a bit scratchy, but this kid’s edit still packs a punch. I still can’t fathom that Kenner toy line, though. A film you’d never take a child to gets merch no one probably bought for the kids they were marketed to. Still wish I bough more than one of those hideously stiff but super-detailed ALIEN figures, though. Mine and its box got mangled by my younger brother when I wasn’t around for a few years, grrrr! This entry was posted in 2017, Commentary, DAF, Features, Humor, Updates and tagged 20th Century Fox, ALIEN Covenant, Coming Soon, Commentary, DAF, Features, HBO, Humor, Mature, May, Movie Trailers, Movies, Not For The Kiddies!, Ridley Scott, Teasers, Violence Is A Very Horrible Thing, YouTube by geelw. Bookmark the permalink.